Elizabeth Warren and Sherrod Brown are under attack by the Obama Administration for their work against the TPP -- but they are fighting back. And they need our support ASAP. On Friday, President Obama again harshly criticized Elizabeth Warren and congressional Democrats who are standing up against the TPP. He said they were “dishonest” and spreading “misinformation” about a treaty that is so secret you and I aren’t allowed to see it. Your Administration has deemed the draft text of the agreement classified and kept it hidden from public view, thereby making it a secret deal… It is currently illegal for the press, experts, advocates, or the general public to review the text of this agreement. And while you noted that Members of Congress may “walk over ... and read the text of the agreement” -- as we have done -- you neglected to mention that we are prohibited by law from discussing the specifics of that text in public. Before Congress votes to facilitate adoption of the TPP, the American people should be allowed to see for themselves whether it’s a good deal for them. 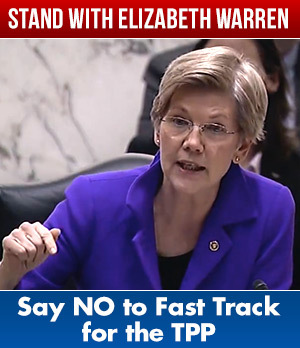 Click here to read Senator Warren and Brown's letter to President Obama.